Definition - What does Tadasana Gomukhasana mean? To practice tadasana gomukhasana, begin in mountain pose. 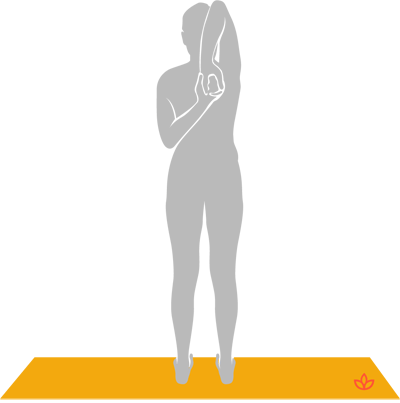 One arm is raised above the head and meets the other arm from below to lock fingers behind the back. The arms are then switched with the opposite arm staying near the head and the other going around the back. Tadasana gomukhasana is also known in English as standing cow face pose. Tadasana gomukhasana pose is beneficial for any depression or low energy symptoms. As a chest opener, it helps the body reconnect with the mind and outer energies. The challenging aspect allows for mindfulness and increases concentration. It could be helpful to close the eyes during the pose to connect the outer sensations felt in the body with the inner mind. As a modification if the fingers don’t quite reach (or maybe the do on just one side), a strap can be used to hold on to for support. It is important to keep the shoulders away from the ears as much as possible and to hold the pose for a few breaths, slowly coming out on the exhale. Additional benefits of both poses include a full body stretch, strengthening the arms, legs, back and core, helping to ease mild depression and expanding the chest to inhale more oxygen leading to an increase in energy.